This was our first ever entry in mid December 2006 and I am doing it again a little spiffed up over this slow Easter weekend. We have just bought 2000 books from the library of the late Angela Carter and about 1000 books of rocket science from the library of the author of 'Halley's Comet and the Principia' (Aldeburgh 1986) including 50 copies of that book. Also alot of genealogy of European nobility, Russian and Polish history and art and some stuff from the library of an intimate of Robert Byron including some of his books. So entries may be less frequent on this page -- but just till I get through 500 boxes of books. Pas de probleme. MODERN FIST EDITION / CRIME / BIBLIOMYSTERY. * I found this at Dunning's own website: "In 1984, with my wife Helen, I opened the Old Algonquin Bookstore in East Denver. 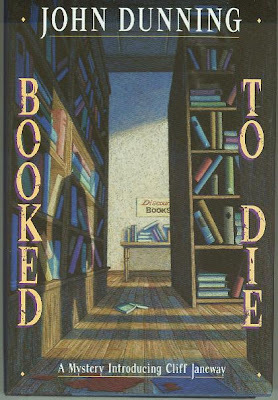 We closed the store in 1994, two years after Booked to Die was published, and have been online booksellers ever since."